Look no further you have stumbled onto the BEST cookie dough dip. The other night my friend Di made the most fabulous Monster Cookie Dough Dip! We couldn’t put it down and kept fighting over it! I don’t normally like a sweet dip, but this one is irresistible! You will also want to try her Chocolate Chip Cheesecake Dip. At our house, we love raw cookie dough. I know I know…. you are not supposed to eat it because of the raw eggs. I must admit we still do. 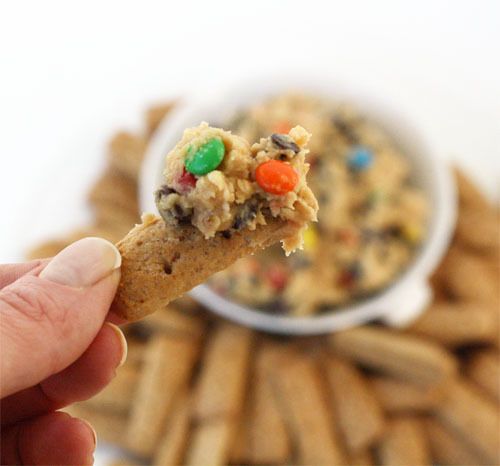 This egg free cookie dough dip is the perfect solution. Egg free cookie dough, yes, please! This sweet dip is perfect with graham dippers! Mix cream cheese, butter, vanilla and peanut butter until smooth. Stir in brown sugar and powdered sugar, mixing well. Next fold in oats, m&ms, and chocolate chips. Serve with pretzels or graham cracker sticks. This makes a ton! I divided it in half and wrapped one half in plastic wrap forming a ball and put it in the freezer. Now I will have a Monster Cookie Dough Cheese Ball for later. I will just need to thaw. 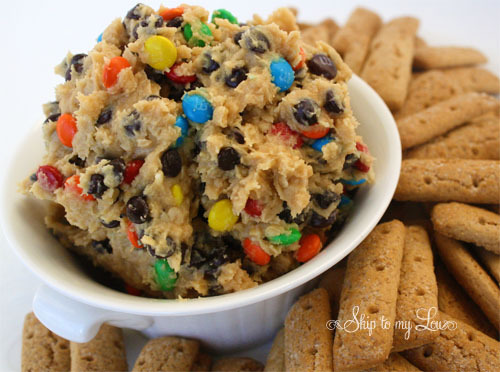 Read all the comments and you will see this cookie dough dip recipe is a huge hit! I actually think it tastes better than just plain chocolate chip cookie dough. If you want to give it even more candy flavor and make it over the top how about adding in toffee bits1?! 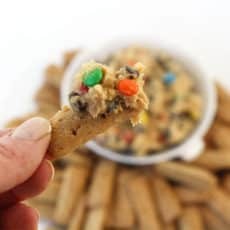 I love this dip served with graham sticks but animal crackers would also be delicious. If you like a sweet and salty combo try pretzels. Use softened butter and cream cheese that has been softened to room temperature before mixing up this dip. This will ensure a smooth creamy mixture that is evenly incorporated. I do think mini chocolate chips and mini m&m’s make it easier to eat. This dip freezes beautifully, remove from freezer to refrigerator overnight. Allow to sit at room temperature for about 30 minutes before serving. If dip has been in the refrigerator allow some time at room temp so it is easy to scoop onto the dippers! A hand mixer or stand mixer is a must for getting the dip super creamy before folding in the oatmeal, chocolate chips and mini m&m’s. I know you are really going to like this dessert dip. If you have allergy concerns please read the comments. People have been so helpful with substitution ideas so everybody can enjoy! Try this chocolate chip cookie dough cheesecake dip variations. Do you love chocolate chips? Silly question I know! Try these recipes. All your recipes like! They are interesting, original and always dishes are very tasty! Thank you for your great site! Was wondering how much this makes .. wanting to make for a cookout with about 20 people. I think it would be plenty for 20 people. Just made this. I didn't have m&m's but had marshmallows. My kids LOVED it. The salty of the pretzel compliments the sweet of the dip. I also used crunchy natural peanut butter. So yummy. Thanks for sharing this recipe. So, I can bake these, right? I love Casey's convenience store's monster cookies so I'm really glad you posted this! Thanks! Erica, since these don't have eggs and baking soda not sure how they would bake up. This version is meant to eat raw. Tina - I'm allergic to wheat, peanuts, and soy. It's a fun combo; but, I make it with sunbutter (sunflower seed butter). Lucy - if you aren't soy sensitive try using a soy based cream cheese. I've had a lot of luck with swapping things in and out of this. I really like using craisins and white chocolate chips in it instead of the chocolate chips. Tina you can try sun butter. How can u make this dip without cream cheese? Like what could be the substitute? For those of you wanting a cream cheese free version. I almost wonder if it can be left out. Has anyone tried this? Love me some cookie dough! Looks amazing! I wonder if it would taste nice if you left out the oats and then swirled it through icecream? This may be a silly question but do I cook the oats? I'm trying to make this right now and I'm afraid to mess it up. Nope Victoria don't cook the oats. If you want a softer oat use quick cooking oats. I like a bit more texture so I use regular oats. Looks good can't wait to try. Is this your original recipe? I thought I seen this somewhere else. Okay, what did I do wrong when I made this? I followed the directions and just the flavor of cream cheese (which I really can't stand). No cookie dough flavor that I love so much. Just PB cups mixed into a cream cheese block that now contains brown sugar. Please give my dumb self some guidance! I am sorry that it wasn't to your liking. I don't think you are doing anything wrong, it may be that you don't like cream cheese? I soften it all and mix it well- it's been a hit at every party! THanks for stopping by. I made this last year for my son's 1st birthday (thanks to pinterest) and as I am planning for year #2 I got an e-mail requesting 'that cookie dough stuff you made last year.' It was a hit! This is the best thing I have ever eaten! this is definitely going in my recipe book, thanks so much!! i didnt care for this. all i could taste was cream cheese. too rich and not sweet like cookie dough. How many servings is this (roughly)? Great for a weekend of camping! I made it the first time with low-fat cream cheese and the second time with regular... both are FABULOUS! Out camping, one of the others said "soften some vanilla ice cream, put in a little chocolate syrup and mix the dip in... instant Blizzard! EXTRA FABULOUS! I couldn't find graham cracker sticks, so I used animal crackers... everyone liked those too. Thanks for a SUPER EASY, SUPER FABULOUS recipe! Would nutella work? I have an allergy to peanuts...will be trying it anyway tomorrow! I don't have any kids around anymore, but will find another reason/excuse to make these! FABULOUS! Make it - you'll love it!!! One of my favorites! YUMMY! I tried your recipe yesterday with my 8 year old daughter and her friends. They all loved it! We used ladyfingers for dipping the monster cookie fought dip, tastend good! Thank you for sharing. DE-LISH!! You'll have to try a similar recipe with garbanzo beans- *healthier* than this recipe (with no dairy), but tastes EXACTLY the same as cookie dough!! Google "chocolate chip cookie dessert hummus"
I have become obsessed with making cookie dough dips... I've made chocolate chip cookie dough dip, choc. chip and heath bits cookie dough dip, cake batter dip, brownie batter dip... I'm always on the look out for new ones to take to parties, so I was obviously thrilled when I saw this picture! However... I'm allergic to all nuts (so almond butter isn't an option)... I also can't stand sun butter, at least in things like sandwiches... would it work (be less noticeable) in a recipe like this? Or...any other ideas on a substitute instead of peanut butter? i'm making this for Easter this weekend!! i'm sure the kids and the adults will all LOVE this! Believe me Verna, It is yummy! Cindy!! I just saw this on Pinterest, clicked on it, and gasped/squealed at where it took me!! What a small world. Hope you and yours are doing well! How funny, I just saw this on Something Swanky too. Looks delish! Love anything with M&M's. This looks amazing- just pinned it! Thanks for sharing! I will have to try this dip!! I am making this tomorrow for our Cub Scout Blue & Gold Banquet...this will make all the Scouts, Den Leaders and Guests VERY happy! Thank you! I'm hopelessly addicted to anything that tastes like cookie dough! Wow! This looks amazing! I can't wait to try it. I love cookie dough but refrain because of raw eggs. So this will be a long awaited treat. Thanks for sharing! OMGosh this is AMAZING the kids love it!!!!! Not to mention mommy and daddy!!!!! ooh! I think Sunbutter would be fabulous instead of almond butter. We prefer that far more than almond butter when recipes call for PB and we cant have it. Whoa! I can feel the pounds piling on already! That doesn't mean I won't be trying it though...! Oh wow! This loooks awesome! I think I will make this to go along with my daughter's Cookie Monster party! Thanks! I am so excited to see my friends pinning your posts on Pinterest! This dip looks amazing! Hope you and your family are doing well! Love ya friend! ...like it's not already addictive enough! Oh my gosh!!! My mouth is watering and I am ready lick the computer screen!! Printing recipe and this will be my next sweet treat I make. Looks like a fabulous idea to me. SO happy you shared...and I found you here. This looks delicious. I crave cookie dough but I know it is so terrible for me. Yummy!! I am sure my kids would love it too. Lol! That looks amazingly delicious! Yum! Definitely trying this out at my next party! WOW. I love cookie dough. Will DEFINITELY have to try this. Love Monster Cookies. This dip looks great.